Forcing myself to entertain this year has really reduced my stress levels. A year ago, a gathering like this would have found me snipping at everyone and unable to sleep. Now, it's almost enjoyable. 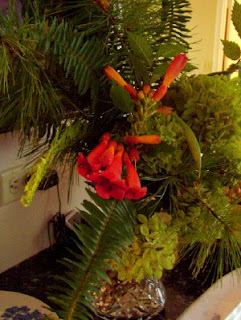 My mom and I cut some trumpet vine on the side of the road for decorating--orange and greens, perfect for a September homecoming. Peach cake baking as I type...mmmm. I get really stressed out when I entertain, too. But, over the years, the more times that I've forced myself to do it, the more naturally I fit into the role of Hostess. Let us all know how it goes for you! There's nothing connected with the word "peach" that doesn't sound fabulous. Meredith, I must have missed something. Who is the homecoming for? I, too, enjoy having company. The comment is usually made that they feel comfortable and at home in our house. That is the best compliment anyone could give...and that is my ultimate goal! I never want anyone to feel as if they can't relax and "kick their shoes off" if they so desire! Would you mind posting your peach cake recipe? thank you for a great blog. I just love your ideas! How did you make the transition from snippy and not sleeping to a reduction of stress levels? I am having people over today after church and "snippy and not sleeping" is exactly me. Inquiring minds want to know!